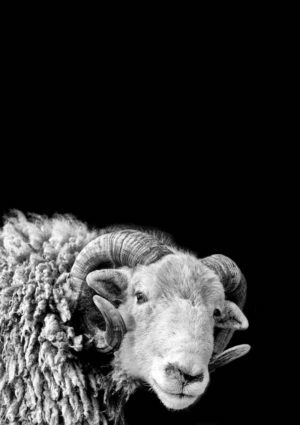 A magnificent animal in this Herdwick ram golden horns poster. A profile view of a magnificent animal in this Herdwick ram golden horns poster. What an animal. A profile view in this Herdwick ram golden horns poster. He reminds me of a chieftain for a tribe of warring, ancient Britons – with his thick fleece coat and symbolic headgear. Herdwick ram golden horns poster!